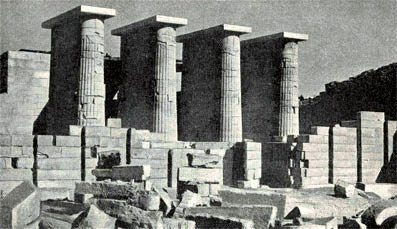 The columns at Sakkara are mainly of two types - fasciculated, in imitation of a bundle of reeds, and fluted, which may imitate bundles of long narrow reeds or thicker reeds cleft down the middle. The second type are seen in the "Little Temple." while above, in the rebuilt entrance to the colonnade, are splendid specimens of the fasciculated columns first erected nearly 5000 years ago.